Discovering his prodigious gift in boyhood and rising to the rank of International Grandmaster, Luzhin develops a lyrical passion for chess that renders the real world a phantom. Foreboding words, right? Words that launch you into a tunnel of worry, regret and gloom. Words that indicate a decision may be nigh and that it's not yours to make. Words that provoke more words and even more words. Words that set off a sequence of events that have to be endured, simply because there is no other option. Words that engender, more than any of the above, more than anything else, hope. Hope that this isn't what it seems. Hope that your worst fears aren't about to be realised. I've never felt like this about anyone before. And yet there's hope. The d pawn is enough of a nuisance to force the white king into the centre. The pleading begins. An equilibrium is surely still possible. In chess, we have the option to end the discussion and move on at any point. Games like this, where an unattainable carrot is dangled in your face, are doubly painful to lose because of the process involved. The possibility of saving the game means a resignation isn't forthcoming as quickly as it should be. 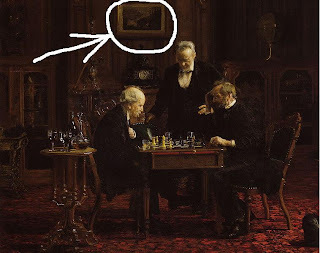 Last week we investigated the hidden meanings of Thomas Eakins (1844-1916) much loved painting of 1876, The Chess Players, and ended with an obscure detail on the back wall. That murky clue is enough to give us a swinging London moment such as David Hemmings enjoyed in Blow-Up in 1966. "What the f*** is going on?" Hmm. A grainy image, though not from Blow-Up's unsettlingly cool and breezy day in a leafy park in South London, where a murder may have been conspiratorially committed; but an unsettlingly sun-scorched, blood-boiling, killing field in Imperial Rome where mayhem most publicly, and definitely, has been. Incendiary stuff. This correspondence was reported by Kathleen Foster (1997), and mentioned by Mary Morton (2010), and it leads us into the relationship between the Thomas Eakins and Jean-Léon Gérôme, and their paintings, which began with Eakins' two-year study with the French artist in Paris from late 1866 into 1868. So as to acknowledge his debt to the Parisian maître, Thomas put a reference to J-L G's "Hail Caesar" into The Chess Players of 1876. But there is more, much more, to it than that. Gerôme is remembered these days (if at all) for his obsessive interest in the Orient, and in particular for his penchant for the voyeuristic portrayal of déshabillé (and less) slave girls, the harem and the like. This side of the Channel, artists like J.F.Lewis and Richard Dadd offered a more English, buttoned-up, version of the same - frills sans flesh. When J-L G found time, in his detumesced moments, he put his fevered imagination aside and rendered, in authentic detail, ordinary everyday scenes of the Middle East and North Africa. And what interests us in this post is that he painted local people playing board games. A handy example is displayed in our own backyard in London, in the wonderful Wallace Collection. You'll find it, of all places, next to the blunderbusses and scimitars in the armoury gallery, not because of the belligerence of their game, but because of their matériel. Gérome painted it in 1859 and he depicts a trio of "Arnauts" immersed in a favoured pastime. Arnauts were mercenaries from Albania, here found in Egypt during J-L G's visit in 1856. According to one source these charmers were renowned for their lawlessness, haughtiness and cruelty, plus they considered everyone else to be subhuman. Double take on the Arnauts: three seasoned campaigners intent on the game, one standing slightly off-centre; one player straight-backed, the other slouched; the three of them forming a pyramid over the board, itself laid out at near eye-level with the viewer on a piece of workaday furniture. Looks familiar? So Eakins' hommage to his tutor was more thoroughgoing than merely including an indistinct Ave Caesar on the back wall: Gérôme's Arnauts informs the essential structure of The Chess Players of 1876. And of course several commentators have also referred to this, including Gerald Ackerman (1969), a Gérôme connoisseur, who points out that Eakins owned a photo of the Arnauts (actually of a similar version - yes, J-L G recycled his own work, something we'll come back to). So, The Chess Players is an hommage with a capital aitch. 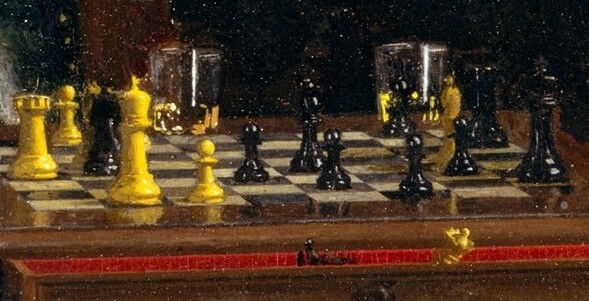 Martin A. Berger (2000), whose "discourse analysis" we explored last week, also noted the formal similarity of the two paintings; but he invokes Gérôme's work as evidence that chess in art was a conventional code for violence, which was, in Mr B's analysis, the essence of the Oedipal undercurrent in the relationship between Thomas Eakins and his father, Benjamin. Mr Berger also makes a point about an apparently insignificant detail: Eakins painted his chess picture on a wooden panel, rather than his usual canvas. This, he says, leads us to see the characters in Eakins' picture as if they were themselves chessmen on the "board of life". This overarching metaphor of "chess is life" is the stage represented by The Chess Players. Upon this stage the (supposed) real life battle between father Ben and son Thomas is symbolically played out. And that, by the way, isn't represented by the chess game between Holmes and Gardel, which you can see; it's the chess game you can't; the one you will have to imagine as being played by Benjamin Eakins, who is in the picture, and Thomas Eakins, who isn't. 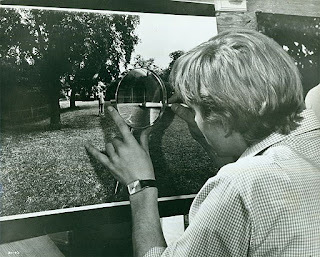 And I don't know about you, but I'm now having a David Hemmings moment. 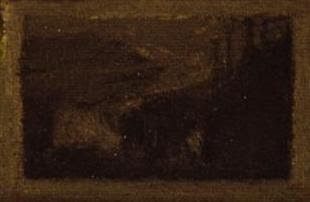 When it comes to a wooden board, Gérôme himself had also painted his Arnauts on one, and of almost exactly the same A3 dimensions later used by Eakins, to boot. So a more parsimonious explanation (to my way of thinking, anyway) of Thomas's selection of that kind of "support" (the term artists use for whatever it is they slap their paint on) for his hommage, was simply that he wished to submit himself to the same technical discipline as his mentor. So, no! IMHO it wasn't the ambivalent relationship Thomas had with his father that somehow lead him to choose, unconsciously or otherwise, something as incidental, and specific, as a wooden panel on which to paint The Chess Players. The deciding factor was the rational challenge he set himself in his artistic practice. And if you want one more bit of evidence to support my rather mean-spirited and retro-empirical outlook (yes, sooo last century's paradigm) just look at Eakins' initial sketch (below, from the Philadelphia Museum of Art) for the head of Gardel: he was clearly thinking of Gérôme's Arnaut for that hand-on-chin, wasn't he? So, my line of conjecture runs as follows: Eakins tries out the Arnaud gesture on Gardel but discards it, because for a painting of a real "live" game of chess where he wants to indicate clearly that one side is losing, he needs a gesture more defining of defeat than doubt, of resignation than rumination. Accordingly, for his final version, he lowers Gardel's hand to steady his palpitating heart. 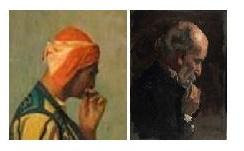 All in all, it is the flesh and blood Gérôme who is key to understanding the Eakins picture, not the mythical Oedipus. Anyway, maybe it's time now to put an end to our wrestling with Mr Berger, entertaining as his book has been, though I'm really not sure if I've got the hang of this "discourse analysis" business. Let's turn to another mystery, this time concerning Gérôme alone. This post has avoided using the full title of his 1859 painting showing the armed-to-the-back-teeth assassins engaged in their recreation. They are Arnauts, of course, of that there is no doubt. But what are they playing? Is it chess? Or is it something else? Not quite another David Hemmings moment, admittedly, but plenty to discuss: too much for one post in fact, so please come back for more next week - Gérôme wasn't built in a day. Martin A. Berger. Man Made: Thomas Eakins and the Construction of Gilded Age Manhood. University of California Press (2000). 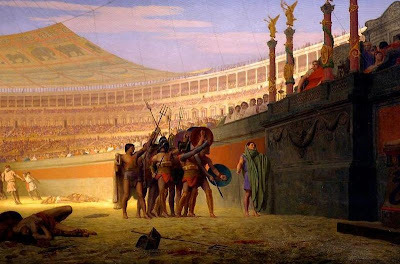 Thanks to Peter Mason for putting me on to the Ave Caesar connection. Whatever happened to the King's Indian Attack? Petrosian-Pachman came up the other day. 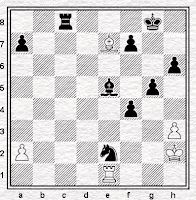 The opening was not what interested me at first - it was the combination at the end which jogged my memory - but looking up the game itself, I was surprised to see it was a King's Indian Attack. It's a while since I saw one of those. "Why prepare" - he evidently thought - "when there is the sound defensive scheme suggested by Lasker?" White has refrained from playing c4, so he can choose between various plans, and in particular, prepare the advance e4. 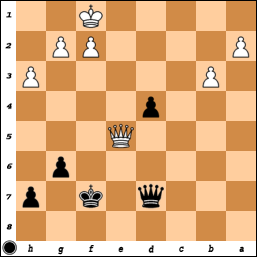 In this case the position of the black pawn at c6 will seem not altogether logical. Very subtle. 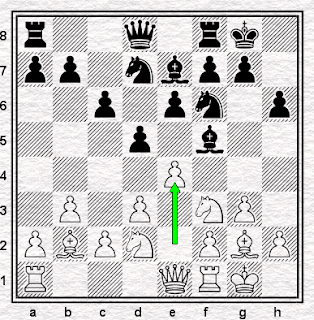 Fischer was more straightforward: like my erstwhile teammate, he played e4 on move one. (No, really, he did.) He actually played the King's Indian Attack in his very first US Championship game in 1957 and he still thought enough of it a decade on to roll it out against - amongst others - Ivkov in 1966, and both Panno and Hubner in 1970. Though quite likely the 1967 demolition of Miagmasuren is his best, and best-known, game with the line. Perhaps he didn't choose to play it against the greatest players on the greatest of occasions, but there's some pretty good players, and some pretty important events, in that list. But none of these games date from 1970. After that, what? Occasionally it crops up in a repertoire book - how to meet the King's Indian Attack if you play the French, or the Sicilian, or the Caro-Kann, or sometimes the Attack via 1.Nf3 (in which instance Kaufman's 2004 book recommends lines with ...Bg4, a sound defensive scheme suggested by Capablanca). But the only time I can recall seeing the King's Indian Attack recommended for White, during my time at the chessboard, was - I think - in Leonard Barden's Guardian Chess Book. And as it happens, that book was old by the time I saw it. It was written in 1967. 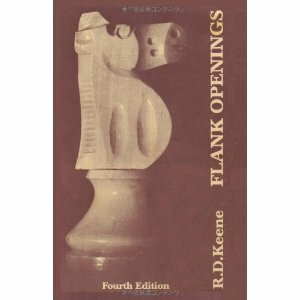 Ray likes it of course, and my copy of Flank Openings (the fourth edition, issued in 1988) devotes almost a third of its pages to the Attack, though here we run into problems of definition, since Ray doesn't assume that e4 is necessarily played - and indeed omitted it when nearly beating Paul Keres at Dortmund in 1973, a game curiously given as lasting 100 moves in Flank Openings (p.144) but only 98 on Chessgames. Ray gives a lot more examples of the greats playing the King's Indian Attack than this short piece is able to, but it's probably fair to say that at the level of world-title contenders, there's not much on view after, say, the death of Jimi Hendrix. So, to sum up much as I summed up the first in this series: where did it go? Was it, if not refuted, rendered positively harmless? If so, how, and by whom? Has it maybe just had a long spell out of fashion? Or have grandmasters been happily playing it for the past forty years somewhere out of my limited sight? I am unwell. 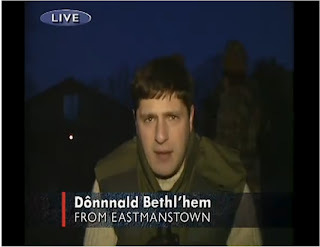 Not 'unwell' as in 'Jeffrey Bernard is unwell' and not 'on my death-bed unwell'. Just plain 'unwell'. Unwell enough to not really feel like writing the planned follow-up to WwwK XXII, though, which is why you're reading this post instead. As long as I can get bishop to e7 in, I should be OK.
Phwoar! and all that. If two clubs who can comfortably put out 190+ averages are struggling, just how strong are the teams at the business end? 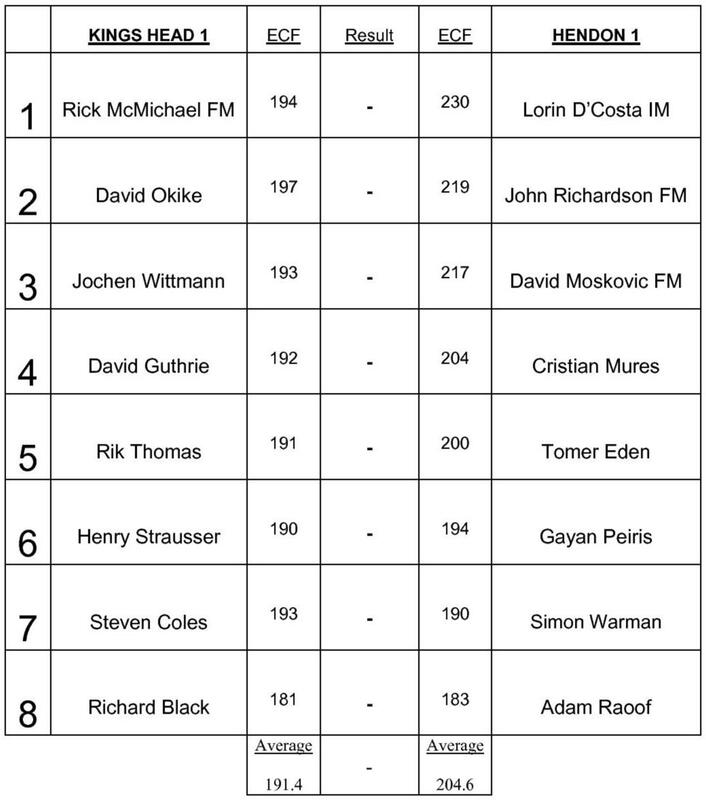 Here are the line-ups for last Monday's match between Kings Head and Hendon. Both teams were on 100% for the season. So Kings Head, who to their immense credit drew this fixture, are roughly the same strength as Muswell Hill. It may therefore be of little surprise that the last three fixtures between the clubs have all finished 4½-3½. All to Kings Head, the sods. Here's the current Division 1 table, courtesy Mike Bennett. You can see just how tight it gets when there are two relegation places from an eight team league. Take note that, despite fielding very similar sides to last season, reigning champions Ealing are in serious danger of the drop. In addition, Willesden's sole victory came against league leaders Hackney. There are no sureties in the Middlesex League and, speaking as a club captain, every match is a rollercoaster along a tidal waves of nervous tension. 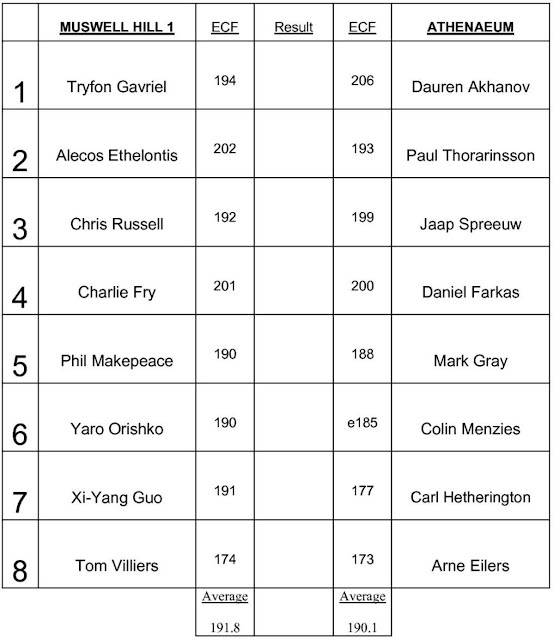 Not least when 9 of the 18 matches I've captained have ended 4½-3½. And I've only finished on the winning end of 3 of those. The London League is, on the whole, stronger. But the size of the divisions means that there tends to be a polarisation in strength, leading to more mismatches and less tension. I still love it, but it's just not quite the same. I'm going grey, Middlesex, and I'm only 22. Be gentle with me. It all seems so long ago: ejh's Chess in Art series. 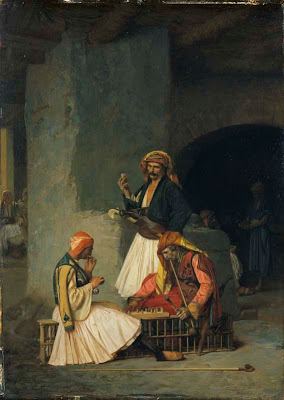 Its final extravaganza of seven Chess in Art works was in October 2008, yes 2008, and included what is perhaps one of the most enduring of chess paintings, Thomas Eakins (1844-1916) work: The Chess Players of 1876. It has a lasting appeal because of its simplicity, its humanity, even its domesticity (that cat). 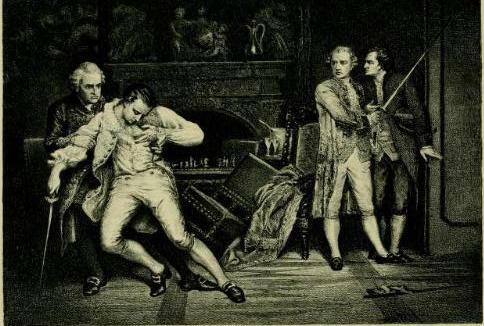 You can immediately empathise with these chess gents of Philadelphia, especially if you are looking at it as a chesser. 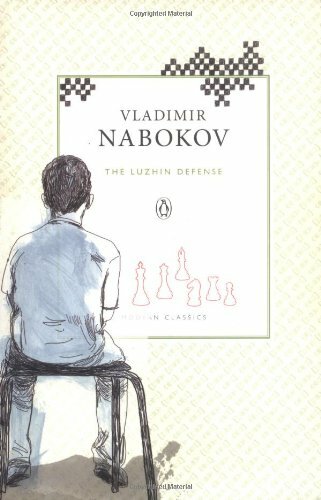 Serious chess is at the heart of the picture; the game is no sideshow to a seduction scene, an existential moment, or a metaphysical reverie. It is a celebration of chess. But in spite of this straightforwardness, the painting offers unexpected depths. We have picked it apart a bit once already in Chess in Art Postscript: Naughty Boys, when we focussed on the formal aspects of the composition, and said something about the artist, but now there is more to be revealed, and ruminated upon. Seriously seeking Eakins : what else will we find? Let's start with the game on the board (you need to look hard because, remarkably, the picture is just A3 size, so the chess board is only about 8cm wide). As we noted before, H. T. Dearden (2008) gave a plausible reconstruction of the position consistent with the body language of the characters, to a man exemplars of educated East Coast society in the "Gilded Age" of US post civil war stability and growth. 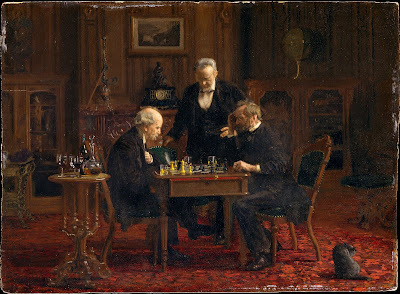 On the right is George W. Holmes (artist, and early mentor of Thomas Eakins) playing black. He is tense and alert as if to pounce on his luckless opponent, the slumped Bertrand Gerdal (who taught Thomas his fluent French). The standing figure, Thomas's father Benjamin Eakins, sides with Holmes, the imminent victor. Benjamin is significant. Watch out for him. 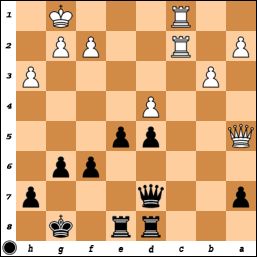 Black is clearly winning, with rather an abundance of extra material, including a bishop on e5. But is it a B? 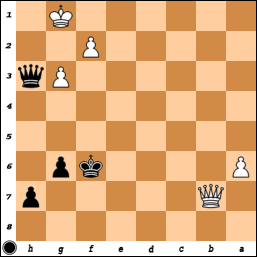 Martin A. Berger (2000) says that, on the contrary, "Holmes's black queen stands commandingly in the center of the board...while Gardel's captured white queen rests ineffectively inside the chess table's drawer". Well, what do you think...is that a black Q or B on e5? 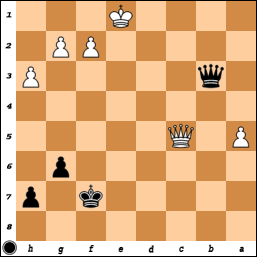 Whichever it is, black to move will win. 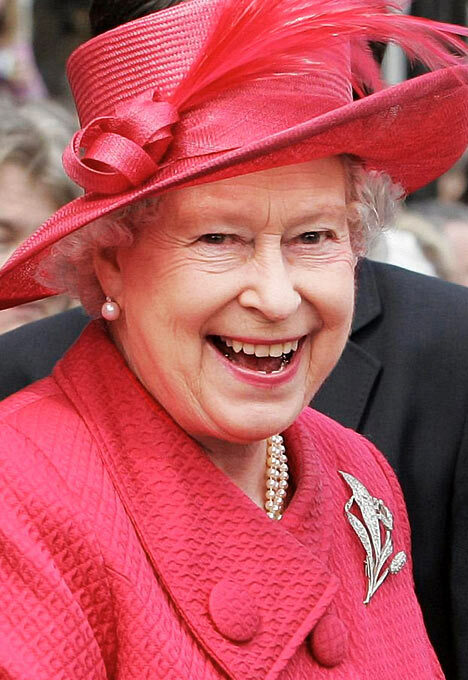 But a queen would be overkill, surely. A bishop would be more chaessthetic - and what clinches it for me is that the black piece on e5 is the same height as the white piece on e7, which we know can't be white's queen. Actually, I can't help also thinking that in the painting white has a piece, almost hidden, on d2 - a knight probably. Another white piece would make more of a game of it, though black would still be winning with three extra pawns and the attack. Next, let's pick over the painting's sociological allusions with Robert Torchia (1991) who we also met before, and who, by the way, also comments on black's won position but reckons "it is not possible to transcribe the exact placement of the pieces". He argues that the picture is symptomatic of the chess explosion in the States following Paul Morphy's triumph in Europe in the late 1850s. Philadelphia, Mr Torchia says, was a hotbed of chess with no less than six clubs in the 1870s, and seven newspaper chess columns in the 1880s (87 in the country as a whole). Indeed the city hosted a "Grand International Tournament" in August 1876 - won by James Mason of Ireland, with Henry Bird third - during the city's Grand Centennial Exhibition to mark 100 years of independence. Bird met Mason again that year in another tournament in New York, and (to get a real game into this post) Bird's brilliancy is here. It is said, btw, that Eakins exhibited The Chess Players at the Centennial Exhibition, although their official catalogue doesn't illustrate it as it does two other chess paintings: J.C.Horsley RA's Checkmate Next Move of 1862, and J.B.Irving's The End of the Game of 1872. Back to Mr Torchia, who argues that the chess, depicted by Eakins as a cerebral and sophisticated pursuit, is a cultural correlate of the mature and self-assured New World, confident that it could beat the Old World at its own game - speaking now economically and geo-politically. Chess is a signifier for the emergence of the US as a world power to challenge that of declining Europe. So far, so chess. There is yet another reading of the Eakins chess painting by Qe5-man Martin A. Berger in his book Man Made: Thomas Eakins and the Construction of Gilded Age Manhood. Chess, and "Constructed Manhood"? Not Übermensch Fritz obviously; so what is he talking about? Mr Berger gives Messrs Gerdal and Holmes a good going-over first, and then turns his attention to Eakins Senior, Benjamin; or more precisely the relationship between Eakins Snr and Eakins Jnr. You can't actually see Thomas in the picture, he is implied according to Mr Berger, and it is as if the two Eakins are facing off for a game. This imagined back and forth chess struggle between them represents their ambivalent relationship in real life. And (keep up) this derives from the different models of fatherhood/manhood that were being worked out, or constructed (so that's it) in the Gilded Age, consequent in part on the way the Civil War had catapulted boys into adulthood. Phew. You won't be surprised to find that Freud's Oedipus Complex putting in an appearance here. Not à la Reuben Fine who used a Freudian analysis of the game to make us chaps feel guilty about playing with our Kings, but in the Eakins father/son relationship. Thus, the picture has Oedipal ambivalence between Tom and Ben written all over it. Literally, in fact, because one piece of hard evidence advanced by Mr Berger is that Thomas signed off the picture not in his own name, but oddly (in Latin, and in red) as his father's son. This is clear in the original, in full view on the drawer, if you can get close enough. Click on to enlarge, and see "BENJAMINI. EAKINS. FILIUS. PINXIT. '76"
And what could be more Oedipal than that? use of naked models without underwear or dress. Golly. Jesus. No wonder Tom's a mess. The book is a fascinating piece of what, in these post-modern days, Mr B says is "discourse analysis" of culture, derived from the methodology of French philosopher Michel Foucault. It weaves an absorbing labyrinth of interpretation, into which once entered one might never escape alive, author included. 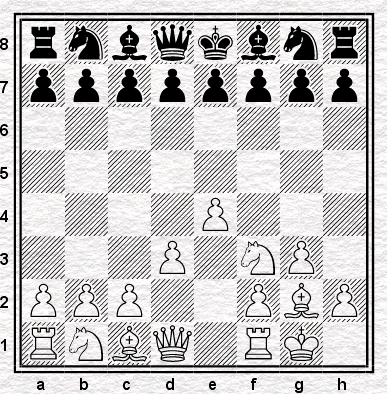 And here's an example: after positing this imagined "allegorical battle across the chess board" between the two Eakins, he concedes this would put them into a notional STBUR* situation (Gardel and Holmes having occupied the correct sides of the board), but no matter because "the only evident outcome of such an arrangement...is to reverse the starting positions of the king and queen..." Mr Berger then continues: "While the game would be "abnormal" it could progress as any standard chess game." A point that he is wise to have relegated to a footnote buried at the back of the book, lest he cop a handbagging by the militant tendency of the Campaign for Real Chess. 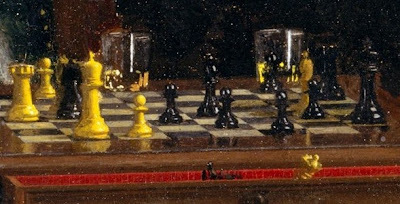 For sure the chessman on the Clapham omnibus might never have expected that a painting of three old-timers and a chess set (and a cat) could be the cause of such flights of fancy. Just imagine what "discourse analysis" would do with J.B.Irving. Now, to finish off this post, look at a clue in The Chess Players to yet another story - which we'll come back to next Saturday. It's an insignificant feature at the back - that painting on the wall. What does the picture within the picture reveal? Please come back to find out. Martin A. Berger. Man Made: Thomas Eakins and the Construction of Gilded Age Manhood. University of California Press (2000). To be fair to Mr Berger, he does refer to Irving's painting; if only to say that it helped reinforce "the game's associations with real world strife". And to be even more fair, his book is a tour de force of research and analysis of all of Eakins work. Reuben Fine. The Psychology of the Chess Player. Dover, New York (1967). The Catalogue of the 1876 Centennial Exhibition is here Irving is plate 258 and Horsley plate 90. Thanks to Paul Timson for his help. Amsterdam, Feb 16. – Six West European countries and the Philippines have offered to stage the match for the world chess championship between Anatoly Karpov, the holder, and his challenger, Viktor Korchnoi, the International Chess Federation (Fide) announced today. The bids to hold the contest were opened by Dr Max Euwe, president of Fide, who said the two Russians would have to make known their preferences by March 2. The bids and offers of prize money in Swiss francs are: Graz, Austria: 1m (£270,000); Paris: 100,000 plus half the television rights; Hamburg: 1m; Il Ciocca, Italy: 150,000; Tilburg, Holland: 1,220,000 (£330,000); Baguio City, Philippines: 1,054,350; Lucerne: 100,000. Korchnoi, stateless since he chose exile in West Europe, attended the bid-opening ceremony today, as did the Soviet Ambassador to Holland. Dr Euwe, a Dutchman, said that although the bid from Tilburg was the highest, Karpov’s side might well object to playing in Holland because it was now Korchnoi’s home territory. The match will be held in July. It will be the first world title clash since Boris Spassky lost his crown to Bobby Fischer in 1973 (sic). Dr Euwe will announced the chosen venue and the exact date on March 16 at the latest, bearing in mind the players’ wishes, technical and climatic conditions and “the interests of Fide and the welfare of chess throughout the world”. – Reuter. 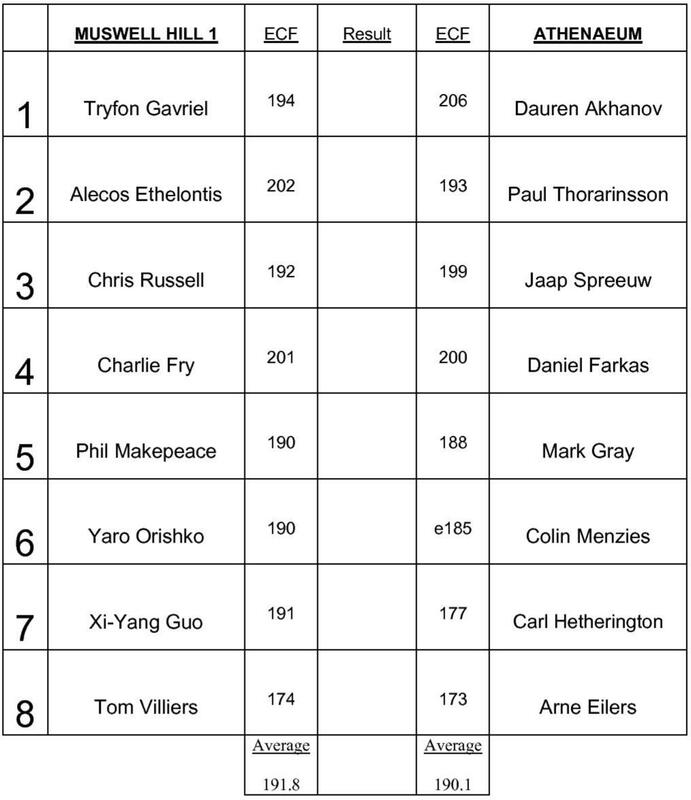 So the Candidates' Tournament is coming to London. Well, maybe. It will take more than FIDE's say so before I start booking my annual leave, but still, you never know. Malc Pein's reluctance to poke it with a ten-foot pole notwithstanding, it might actually happen. That London is again being mentioned as a venue for such an event is a pleasant surprise. If FIDE really wants to popularise chess worldwide, holding its premier events in places other than Kazan and Elista is probably not a bad plan. Not a great move from Kirsan and his mates, then, to let Pein's bid for the World Championship match slip through their fingers. Yes, it's possible to get a little first world*-centric about all this. Even so, while recognising that the economics of the chess world have completely changed since the fall of the Soviet Union (then: we had virtually all the money, they had virtually all the best players; now: they have virtually all the money, they have virtually all the best players) Western Europe still seems to be a rather good location for a chess tournament. Which brings us to the article that appeared in The Times on this day in 1978. OK, Karpov-Korchnoi ended up in Baguio City in the end, but of the seven nation army of potential World Championship hosts competing to stage the greatest event in chess thirty-four years ago, no fewer than six countries came from down our way. None of this relying on a planeful of cash from Azerbaijan either. When we were Kings, Western European sponsors wanted chess and were prepared to bid big sums in their attempts to get it. * A term that's long-since been out of fashion, and, if truth be told, not one that was very frequently employed back in the day. It was all third world this and third world that, the first two worlds tending to go without labelling. Well, the third world became 'developing countries' then 'Newly Industrialised/Industrialising Countries' while the second world dropped communism and out-capitalismed its erstwhile capitalist rivals. That it succeeded in concentrating the wealth of millions into the hands of a tiny few is, I suppose, why it's able to afford to buy football clubs and fund chess tournaments.